Heterotrimeric G proteins are composed of an a-subunit, a P-subunit, and a Y-subunit. The P-subunit and Y-subunit are considered to be a single functional complex, because they do not dissociate in nondenaturing conditions. The a-subunit can bind and hydrolyze guanosine triphosphate (GTP). They are called heterotrimeric because of the three different subunits and G proteins because they display highly selective binding for guanine nucleotides. 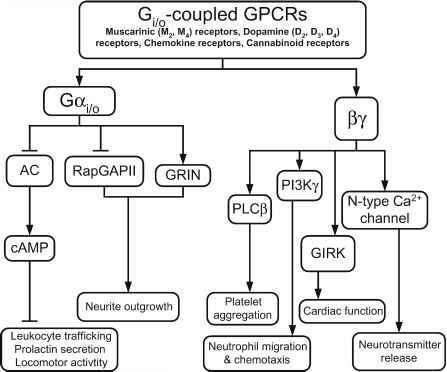 In the basal state, the a-subunit, which is bound to guanosine diphosphate (GDP), associates with the Py complex. Upon ligand binding to the GPCR, the latter undergoes a conformational change such that it promotes the exchange of GDP for GTP on the a-subunit. In the GTP-bound state, the a-subunit dissociates from the Py complex, and both the a-subunit and the Py complex can interact with and regulate downstream effectors to evoke physiological responses. However, the hydrolysis of GTP on the a-subunit results in its re-association with the Py complex, leading to the dissipation of the intracellular response. There are several other levels of regulation for this system, such as regulators of G protein signaling (RGS), activators of G proteins signaling (AGS), and G protein receptor kinases (GRKs), which have been described in detail in many recent reviews (9-11). Briefly, RGS proteins increase the intrinsic GTPase activity of the a-subunit; AGS proteins activate G proteins independent of GPCR-mediated signaling, and GRKs phosphorylate key residues on the GPCR, leading to desensitization and/or endocytosis of the receptor.